A complex system of low pressure to the south gave a forecast North East wind For Tuesday 10th May. The Race Officer, Chris Bell, had a difficult decision as the wind was from the south driven by a dying sea breeze. He positioned the Committee boat Lizzie between Trefusis mark and the Governor Buoy and set a course for southwest wind. All classes were given the same course, start, Governor to starboard, Trefusis to port, Finish (Club line), distance 2.8 miles. The ten yachts in Q class made a slow but orderly start bunched up by the committee boat. 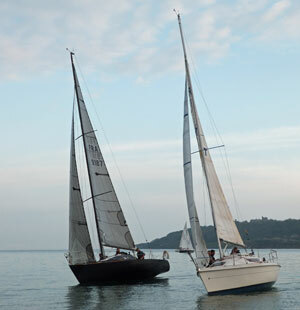 It was a balancing act between a stronger zephyr in the middle of the Carrick Roads and a strong flood tide. We watched the fleet as we came down just below the line on port tack. Per Elisa, Robbie Tregear was in a good position together with the two Sigma 33s Excelle, John Fox and Afrita, Andrew Laming. Temeraire, Martin Eddy and Tai Mo Shan were in the bunch and Charles Choak on Minx had a good position on the line to leeward. As they all went off on a starboard tack we saw Rampage, John Hicks split away from the fleet and dive off toward the western shore on port tack. He appeared to be going sideways toward Flushing in the ever strengthening tide. In U class 9 yachts were lining up behind, ready to start 5 minutes later. On Trifle we noted that David Cunliffe in Encore was quite a way behind the rest of his Q class rivals and we tacked in just below and behind him with 3 minutes to go. Kaimana, Nigel and Jess Rowe were just above us and making good progress toward the line. Many of the other U class were struggling some distance from the line as the zephyr had all but gone. We closed on the line and had to bear away for 70 seconds so as not to be over. The horn sounded and we were off. I looked over my shoulder and saw Kaimana get a perfect start. On Trifle we managed to get some breeze further out into the Roads and soon found ourselves near the rear of the Q class boats. Scorpion, Geoff Davies, Excelle and Temeraire were just ahead of us. We tacked on a wind shift and went toward the western shore where Rampage looked to be stationary. Per Elisa tacked with us and a while later we saw most of the fleet behind us! Then it happened! We saw Per Elisa come up from behind with a new wind and worse, we were in a tide line of muck and seaweed going backwards! Rampage then picked up wind inshore and Temeraire, Encore, Tai Mo Shan and Per Elisa went over to gain the advantage. We had tacked off to get out of the tide stream and then tacked back toward the pack. In light winds the tack angles become bigger so everybody overstood the Governor buoy to allow for this and the tide taking us back to it. On the radio we heard several yachts from U class and W class retiring, unable to cross the start line within the allotted time. Rampage was now on a starboard tack going for the Governor. Above her and with good boat speed was Encore followed by Temeraire. Per Elisa had tacked early and was below us as we chose the middle line. A breeze! We picked up pressure in the sails and rounded the Governor inside Encore and Rampage. We set our Spinnaker on a port pole and set course for Trefusis where the committee boat was positioned for a shortened course. Up to windward we saw Rampage set her kite with Encore close behind. The rest of the fleet had got the breeze and we saw them all playing catch-up coming up from behind. The wind went forward and we lowered our pole and set the spinnaker forward. John Hicks to windward had lost the wind entirely and dropped his spinnaker in favour of the genoa. We continued on port and were headed toward Trefusis Point. At this stage it looked like we would cross the finish line ahead of Q class! A massive wind shift caused us to drop the spinnaker and tack onto starboard following Rampage. 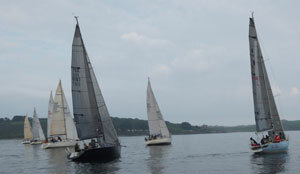 The rest of the fleet were a long way behind but then a fresh breeze came out of the Penryn River. Encore tacked onto starboard and went into the new breeze. Per Elisa did the same and right on their tail was Neil Chamberlain in Tai Mo Shan. They tacked back onto port and went for the finish. Encore, David Cunliffe beat Rampage, John Hicks by 1 second! Tight racing in difficult conditions. Per Elisa was third over the line. As with all handicap racing the positions change when time corrections are applied. On corrected time Encore was first, beating Tai Mo Shan by 1 second, Temeraire was third some 11 seconds behind them. We finished ahead of a couple of Q class boats and had the best sail of the evening back to the moorings. Being the sole survivor of U class we had a sail over. Well done to the crew of the sole Working Boat, Winnie, Arthur Williams who tried in vain to get to the start. Thanks to the Race Officer, Ops Room Crew, Catering Staff and Giles the boatman who brought us back to the packed Clubhouse for beer and food.